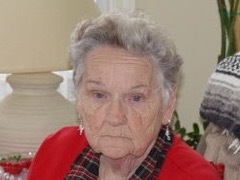 Mary Vee Railing, age 95 of South Bend, passed away at her home on Saturday, February 2, 2019. Mary was born January 18 in Toledo, Ohio. Upon his return from the Army in WWII, she married Charles Bedford Railing in Pennsylvania. Charles preceded her in death. Surviving are her children Ronald (Yun) Morgan Railing of Pennsylvania, Joseph William Railing, Sr. of Granger, Indiana and Elizabeth Vee (Jim) Kuszak of Kokomo, Indiana. Surviving as well are seven grandchildren; Michael, Rhonda, Patti, Joe Jr., Chas, Kevin and Andy, and several great grandchildren. Her oldest son, Charles “Chas” David Railing preceded her in death during the Vietnam War in 1967. Cremation will take place and the Railing family will remember Mary in their own special way. Cruz Family Funeral Home and Cremation Service of Osceola is assisting with the arrangements. Mary will be laid to rest beside her husband at a later date in Evergreen Cemetery, Gettysburg, Pennsylvania. Mary was employed as a custodian for many years both in private homes and businesses and at the University Club of Notre Dame. Even after retirement, she continued working and driving until she was 94 years old. In her spare time, Mary enjoyed spending time in her flower garden or sitting on her back patio watching the birds and animals that gathered around her backyard pond. She also loved watching football, especially her Pittsburgh Steelers and Notre Dame Fighting Irish. Mary was also involved in the community as a “Gold Star Mother of the Marines” and served as the Grand Marshall of the Mishawaka Memorial Day parade in 2018. In her memory, donations may be made in honor of her son Chas to the Wounded Warrior Project. To leave an online condolence or light a virtual candle in her memory, please follow the links provided on the “Tribute Wall” tab above.